To edit a table row, click in the table row and click the Table Row Properties button in the editor toolbar or in the right-click Context Menu in the editor. 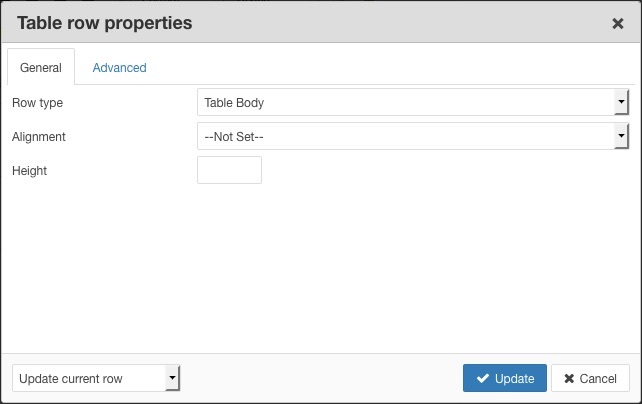 The Table Row Properties dialog consists of two tabbed areas - General and Advanced. Select css classes from your template stylesheet to apply to the row. Additional class names, seperated by a space, can be typed into the field. Set a unique id attribute value for the row. Set a summary of therow content. 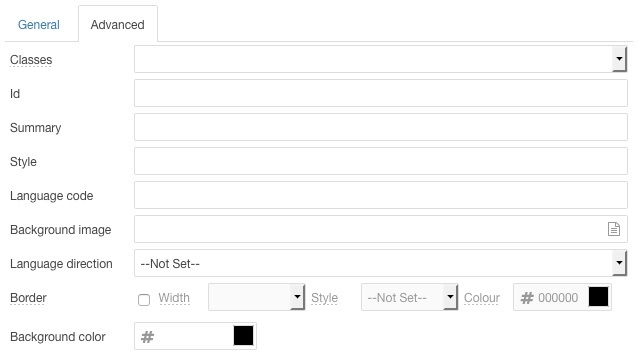 Set the row border styles by checking the checkbox and selecting a Width, Style and Colour. Set the row background colour in hex format eg: #cccccc, or select a colur using the Colour Picker. Any changes made to the row can be applied to the selected row, all rows in the table, or all odd or even rows. Select the desired option from the list in the bottom-let of the dialog. Rows can be inserted before or after the currently selected row. To select a row, click anywhere within the row. To insert a row before the selected row click the Insert Row Before button in the editor toolbar or right-click Context Menu. To insert a row after the selected row click the Insert Row After button in the editor toolbar or right-click Context Menu.